by Josh Tickell Author · John Mackey Author of introduction, etc. 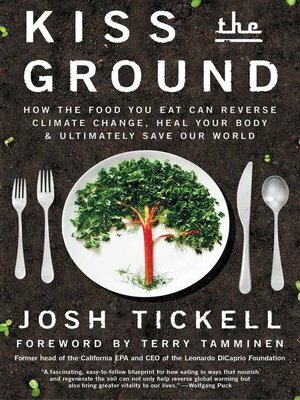 From Josh Tickell, one of America's most celebrated documentary filmmakers, comes a "fascinating, easy-to-follow blueprint for how eating in ways that nourish and regenerate the soil can not only help reverse global warming, but also bring greater vitality to our lives" (Wolfgang Puck). "A must read for anyone committed to healing our bodies and our Earth" (Deepak Chopra), Kiss the Ground explains an incredible truth: by changing our diets to a soil-nourishing, regenerative agriculture diet, we can reverse global warming, harvest healthy, abundant food, and eliminate the poisonous substances that are harming our children, pets, bodies, and ultimately our planet. This "richly visual" (Kirkus Reviews) look at the impact of an underappreciated but essential resource—the very ground that feeds us—features fascinating and accessible interviews with celebrity chefs, ranchers, farmers, and top scientists. Kiss the Ground teaches you how to become an agent in humanity's single most important and time-sensitive mission: reverse climate change and effectively save the world—all through the choices you make in how and what to eat. Also a full-length documentary executive produced by Leonardo DiCaprio and narrated by Woody Harrelson, "Kiss the Ground both informs and inspires" (Marianne Williamson, #1 New York Times bestselling author).